The addition of fresh ginger gives a tasty twist to this French classic dessert. In a roasting dish, place your chosen bowls or ramekins (we use small cereal bowls which work well for both cooking & presentation). Fill your kettle and boil, turn on your oven to 120 degrees. In a medium saucepan, add the cream, milk and the vanilla pod (split, seeds scraped out) and the ginger (peeled & finely grated) – gently bring to the boil then turn off the heat, cover and let stand for 5 mins to infuse. In a clean bowl, place the egg yolks (reserve five of the whites for the meringue recipe below! ); add the caster sugar and whisk, by hand, until pale and thick. Add the vanilla extract and whisk again to combine. Pour the hot cream mixture through a sieve onto the egg mixture, combining by stirring with a spatula. Pour into a heatproof jug and gently divide among your serving dishes in the roasting tin. Carefully pour the boiling water into the roasting tin so that it comes roughly 1/2 way up the side of your dishes. Place on a central shelf in your oven and cook for 20-25 mins. You can open the oven after 20 mins and gentle move one of the dishes to see if it is cooked – it will still have a slight wobble in the centre if it is. Remove from the oven, remove the dishes from the water bath and place on a cooling rack – when fully cooled, place in your fridge until needed (up to 2 days in advance is fine). To prepare the topping, scatter one tablespoon of demerara sugar and, using a chef’s blow torch, caramalise the sugar. Wait for a couple of mins and then top with some fresh fruits, dust with icing sugar & serve – bon appétit ! 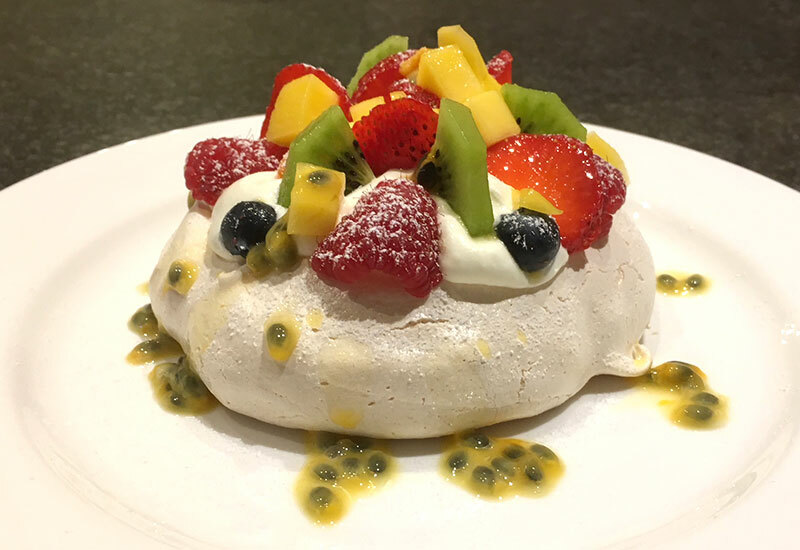 With your left over egg whites (you can keep in the fridge in a sealed contained for a few days or even freeze) this is perfect pavlova meringue recipe. Heat your oven to 150 degrees, line a large baking tray with a good quality baking paper or silicon sheet. Place the egg whites in the bowl of your electric mixer. Whisk on full speed until the soft-peak stage. Add the caster sugar (with the machine still running) wait a few seconds and then add the icing sugar. Whisk for a further five minutes. Spoon the mixture into the centre of your lined baking tray and, using a pallet knife, shape into a circle or roughly 20 cm. Bake for 30 mins, then reduce the oven temperature to 120 degrees and bake for another 60 mins. Switch off your oven and leave (with the door closed) for 6 hours – this will give the crispy outer meringue and the wonderfully gooey interior. You can also use the exact same mixture for individual meringues (see photo below). 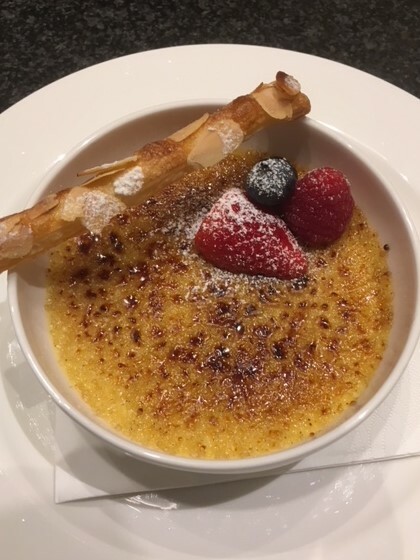 You will need two lined baking sheets on which you place six portions of the mixture on each (about an 8 cm circle, leaving space between them) – bake for 10 mins at 150 and then 25 mins at 120 – again, leaving the oven closed at the end of the cooking time for 6 hours.